By far the best dim sum this city has to offer. 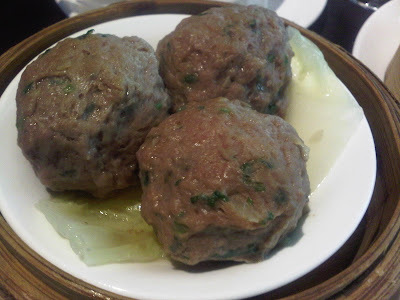 And it opened just in the nick of time since the usual dim sum haunt - Taipan at the Oberoi has become quite inexcusable! The quality of the dim sum so far has been quite consistent and really up to par. I am impressed. The dim sum menu is available for lunch and dinner both. They also have an unlimited dim sum brunch for a very reasonable price of Rs.1088 ++. Which includes a soup, noodles or fried rice and dessert. However if you are willing to spend I would recommend ordering a la carte on any other day because I didn't find the quality as good or fresh on a Sunday. Turnip Cake - Turnip Cake is usually pretty amazing. No its usually very amazing... but this one is not. Not worth ordering unless your a vegetarian and want more variety. Pork Spare Ribs in Black Bean - Perfect just how it should be. Light broth flavoured with yummy pork fat, black bean and chilly. There is a fair amount of pieces of fat and bone as there always is in this dish.. Just a warning if your squeamish. Chicken Shu Mai - Honestly I understand they need to cater to everyone and that is why they should have this in two options: Chicken and Pork! Shu Mai is traditionally made with pork, shrimp and mushroom.. for good reason. Lets not try and fix something that isn't broken. Normally I would say go ahead and order but the last time I ate this was on a Sunday in fact, when it was overbearingly fishy. Could just be the Sunday issue though. Glutinous Chicken Rice Wrapped in Lotus Leaf - If you like sticky rice or dont mind mushy foods this is very good. I was quite impressed with their attempt of this dish. Cheong Fun - Shrimp and Char Siew Pork - This is the one dish you would be denied if you came on a Sunday for dim sum, and what a shame that is. It is a safe bet for anyone with a gluten allergy since it uses rice flour. Their char siew (sweet bbq pork) ones are usually quite good. However, the last time I found the char siew lacked its signature sweetness and was a bit dried out. The Prawn Cheong Fun however was as awesome as always. Don't forget to drizzle the special sauce on top ! Har Gau - Plain Shrimp Dumpling - The skin should be as translucent as possible, with nice succulent fat pieces of shrimp inside. They managed decently on both accounts. Fried Squid Paste - Squid paste doesn't sound like the most palatable way of phrasing it but its delicious! 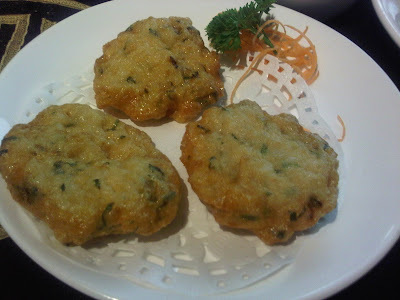 The same slightly rubbery texture to any shrimp or fish cake. New on the menu. Glad I ordered it. Tenderloin Balls - Honestly they taste as bad as they look. Insipid and uninspiring. Shrimp and Chive Dumpling - Not exactly the same as the Har Gao - But very similar except it has chives and is differently shaped. It is deelish and you should definitely order it! Scallop Dumpling - They have changed their scallop dumpling from the first time I visited. Thankfully someone else on our table took a chance on them again because I was really not impressed with them before. 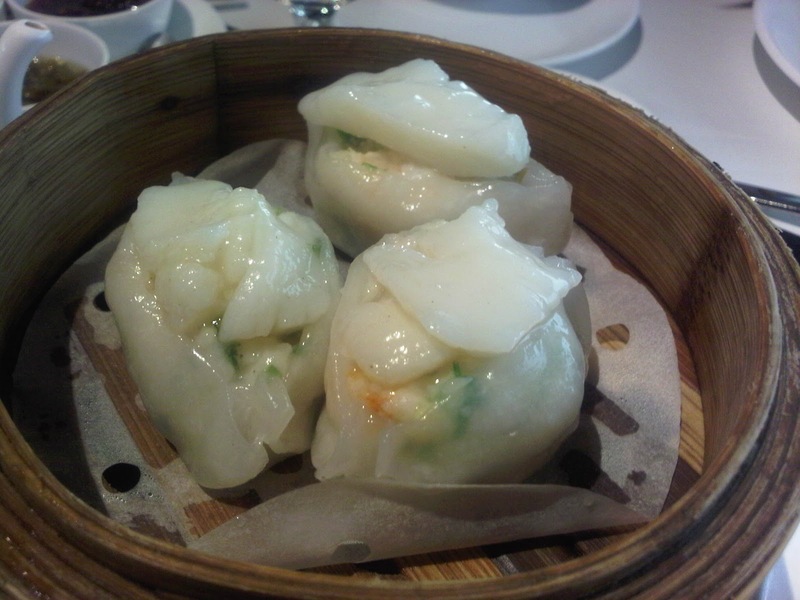 Sweet, tender pieces of perfectly cooked scallop on top of the dumpling that is stuffed with Shrimp and other seafood. Loved it! Seafood Dumpling - Meh! These could definitely do with a make-over too. Seafood Dumpling in Chilly Oil - Good . Not much not to like. Its not my favourite but I usually order one of these. I find the skin can be a bit thick on these. Sesame Prawn Rice Paper Rolls - Mmmm. They stay fairly grease free despite having just been dunked in a deep pan of hot oil. The rice paper is perfectly thin and crisp. And they are not stingy with the fat juicy prawns in side. Honestly, sesame, prawns and fried... How can it be wrong! Baked Pork Puffs - Stuffed with delicious Char Siew (sweet bbq pork) and surrounded by buttery delicious pastry. Sounds quite up to the mark wouldn't you say? They do this really well and its become one of my favourites... A must order! Beef w/ Asparagus - I was not crazy about it but it was worth trying. Thin beef, wrapped around baby asparagus, char grilled and topped with a sweetish, black peppery sauce. Dim Sum Dessert - The dim sum menu has its own set of desserts, that are very classic Chinese desserts. 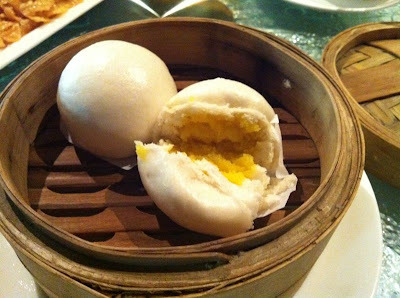 Steamed Sweet Egg Yolk Bun - I know they should work on the name. It turned a lot of people off on our table, to a point where they could not even bring themselves ot try it! But take my word for it it is so good! The bun is slightly sweet and the egg yolk filling is essentially sweet custard just not as creamy. Its really delicious. Sweet Almond Bean Curd - A little too sweet. Topped with a chopped up assortment of fruit - never had it like that before - but it went well. Normally this dessert is not so sweet, in fact it may even have a slight bit of bitterness to it. The bean curd of course is extremely soft with a distinct almond flavour to it. Mango and Coconut Pudding/cake - Very jelly like consistency. I quite liked the coconut one because the flavour was defined yet subtle, and they went easy on the sugar with this one. The mango one is pretty much how you would expect it to taste, I didn't care too much for it but you may. Crispy Aromatic Duck - Instinctively on my first visit I tried the Peking Duck which was not bad but not great. Next visit I tried the Crispy Duck instead and I will never turn back. 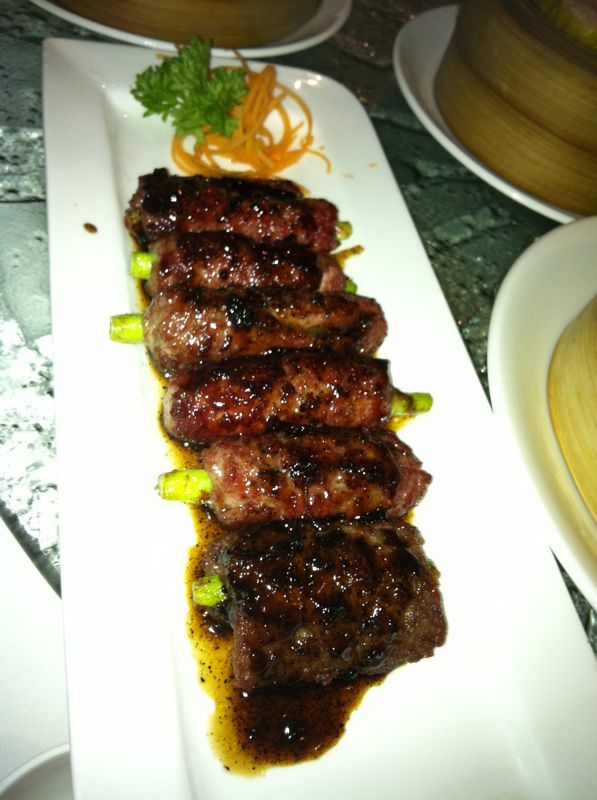 Served with all the same accompaniments as the Peking Duck - plum sauce, pancakes, spring onions and cucumber. I must add though the last time I ate this.. Also on a Sunday .. The Crispy duck was just not up to par. The meat was really dried out and chewy with no distinction between the tender meat and the crispy skin. I hope they were just having a bad day. But shall update on my next return. Kung Pao Chicken - Some strange reason they chose to put peppers (capsicum), which is not very authentic. All those who are used to eating the American version of kung pao need to know that kung pao is not chicken tossed in hot sauce with carrots and celery, but tender pieces of chicken with a thick soy and sweet soy glaze with peanuts, schezuan peppercorn and dry chillies. This time we are a little closer to the real deal. Whole fish w/ Soy, Scallions and Ginger - This might be a bit bland for many, but those that love it love it. I honestly prefer the bass to the grouper. I find grouper meat to be tougher and drier. Crispy Beef w/ Orange Sauce - Crispy on the outside but tender on the inside. The sweet orange sauce is a perfect match. To sum it up in order to get the best of Royal China I prefer to stick to the dim sum and the crispy duck. And if you are still hungry well then order away. Budget: Expensive . But set lunches including the unlimited dim sum lunch - very reasonable. Great value for money.